Dr. BS Ajai Kumar is the chairman and CEO of HCG. Dr. Ajai Kumar founded HCG to realize his vision of making advanced cancer care accessible to all. He has been the driving force behind HCG’s growth since inception. 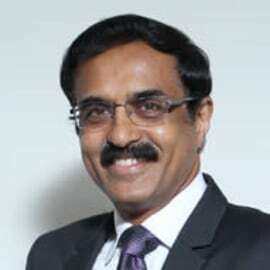 He has served as the CEO since 2005. Dr. Ajai Kumar’s contribution to the field of cancer care in India as well as his successes as a first generation physician entrepreneur has been widely recognized. He has been awarded the Ernst and Young Entrepreneur of the Year Award, the CII Regional Emerging Entrepreneurs Award, and the BC Roy Award by the Indian Science Monitor. He is also a recipient of the Karnataka Rajyotsava Award. Dr. Ajai Kumar has been a practicing oncologist in the US and India for over three decades. He completed his residency training in Radiotherapy from the MD Anderson Hospital and Tumor Institute of the University of Texas, and his residency training in Oncology from the University of Virginia Hospital, Charlottesville. He received his MBBS from the St. Johns Medical College, Bangalore.